I notice i've been having trouble with triggering Traffic lights. I live in a smaller town and not that many during some parts of the day. So i pulled up to a red light and wanting to turn Left at a Major intersection with on coming traffic the light never triggered for me. So i had to wait for a car behind me to pull up after 2 - 3 mins ... i tried rolling back and setting the light to trigger no go. Am i doing something wrong or has anyone else had issues like this before? Have you ran a red light due to this issue ? I have the same problem. I sat at a redlight by myself for about 5 mins one time. I eventually gave up and ran it. I'd like to know if our bikes will set them off or what? alot of bikes wont set off the trigger for lights except for maybe the big boys (busa's harleys etc..), you'll have to look up the state law cause alot have one for bikes in this situation, they passed one in wisconsin where i live for the lights where if your on a bike and your the only one on your side and the opposing (so basically no cars to set off the the lights in either parelell direction) you can just go after 45 seconds of the lights not changeing obviously watch for traffic from the sides, ive done this a couple times and there happened to be a cop sitting on the side of the road gunning people once i went and looked over at him he just nodded his head and gave a thumbs up like i did the correct thing so good deal. I think the triggers are magnetic. Some bikes don't have enough metal mass to trigger them. That's right. Our bikes don't contain enough ferrous material to trigger some light sensors. They sell devices that you can attach to your bike and are supposed to solve this problem, but I don't know anything about them. Hopefully someone who has one will see this thread and post up. If there's a car behind me, I usually just motion them up on the sensor with me, and if not, I look both ways and roll on the throttle. Not necessarily ALL light sensors are magnetic. Newer ones are triggered via video. However, most lights are still triggered magnetically, and even some that have video triggers, also have magnetic triggers. Since our bikes contain more and more aluminum and less steel each year, it is becoming harder to trigger light sensors with our bikes. Quick fix: Go online and by three or four "Rare Earth Magnets" AKA "Neodymium Magnets". Next, super glue them to the bottom of your bike somewhere. Doesn't really matter where, just somewhere on the bottom side of the bike. These magnets are STRONG, and by being present on the bottom side of the bike, the magnet disrupts the magnetic field of the light trigger. You will definitely tell a huge difference before and after the magnets. I run em after ensuring its clear. You can usually see the sensor lines on the road if they're there. My instructor at the MSF course told us to try to position our bikes directly on top of the line. They come in all shapes (square, rectangle, circle) but you should try to put your bike on the line as much as possible. I also saw another tip: put your kickstand down over the line. I haven't tried this one yet but apparently it works pretty well. 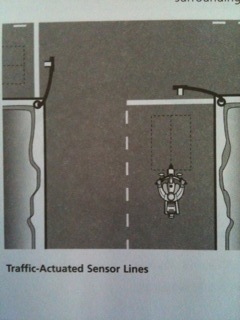 I attached a photo from my rider course book.